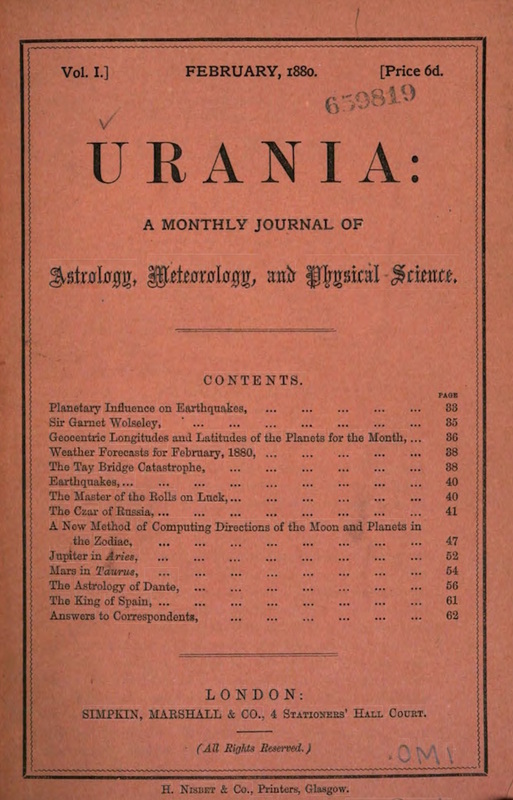 A Monthly Journal of Astrology, Metereology and Physical Science. London, England. Publisher: Simpkin, Marshall & Co. Editor: Alfred J. Pearce. 1/1-9, January-September 1880. 6s. 6d. a year. 32 pp. 9 issues only. Pearce (1849-1923) was a homeopathic physician and belonged to the “scientific” side or astrology, as contrasted with the occult. He also edited Star Lore, the Future and Zadkiel’s Almanac. On him see the note under Star Lore. Advertised in Banner of Light 47/19 (July 31, 1880): 5. Northwestern University.